What can I say? In 2005, who'd a thunk it would come to this? Nervous? I think they are smart. I can't wait to go to this. Necessity is the mother of invention. When your product isn't selling and you still have to pay the bank, you do what you can. I went to the one they had months back but it was only virginia condos. this one has condos for the whole dc area. This doesn't smack of desperation to me, it simply seems like inventive marketing. Yes, sales are probably not as brisk at many projects these days, but I hardly think it is time for a metro-wide fire sale. I think this is a great way to create buzz (it sounds like an impressive event) and put people in a position to see many projects they may have never heard of. I think there are plenty of buyers out there, they just need to be sold the right thing. I went to the one several months back held at Halo on P Street. 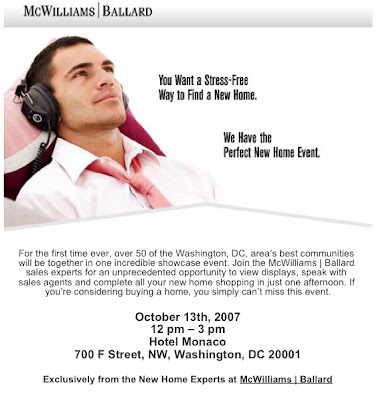 It was packed: lots of potential buyers...and lots of salespeople spewing the same crap. The salespeople for Jenkins Row noted how the building had sold out but that a few units had come on market because some people who worked for a marketing firm, who should not have been eligible, bought units. Right. I now see more information on Jenkins Row than I have ever seen, and more units available. The sales people typically have a better view of the market, and can create artificial shortages to boost prices. Right now its obvious there are no shortages. Their choices are to lower prices for the units, many of which are basically uninteresting boxes, or they can continue to pay for open houses and the hype of the salespeople, wine, etc. Although the DC job market is strong, thanfully, prices are still way out of line. If they come back into some reasonable price range, the condominium stock will move rapidly. People still like to own. But I don't expect it. So I'll be there at yet another one of their events, looking for an interesting 1 bedroom, plus den, with interesting entertainment space (a balcony or terrace maybe), in a good location, and not one that will need the next boom 15 years from now to be safe. I am willing to spend $550 thousand, but for the crap I see I will keep my money and stay in my current condo.